Ticket sales stats show you a detailed breakdown of what tickets were sold when and how much money was made. 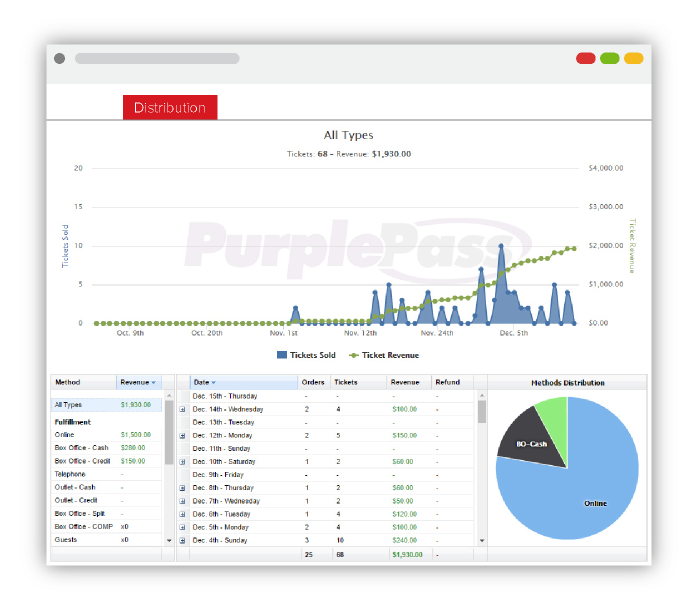 The breakdown includes sales by ticket type, by day, by price point, with options to filter by date rate, group by day, week or month, as well as focus on a particular ticket type in complete detail. The distribution stats show you exactly how the tickets were sold. There are many different ways a customer can buy tickets. For example, they can buy online, at the box office, over the phone, from a retail outlet, or at the door at the event. Knowing how the tickets were sold, when, and their method of fulfillment all play a key role in your planning. The marketing stats tell you where your customers came from before they found your event. Did they search you on Google, did they come from a Facebook post that their friend shared, or did they come through a Twitter post? Having all of this information is critical to planning your marketing strategy. 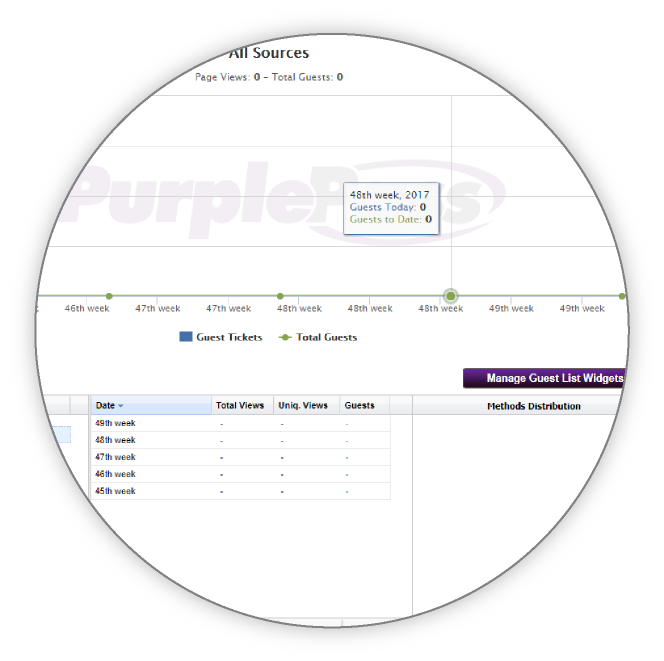 In addition to organic sources of traffic, you can also view performance reporting of sales that came from tracking links. Tracking links are custom links that you can create that allow you to monitor where sales are coming from. For example, if you send an email newsletter to all of your customers with a link to buy tickets, you can track how many people clicked on that link and bought tickets. If you are giving commission to promoters for helping to sell tickets, use a special link for each of them to track their performance. View the performance of your built-in Facebook efforts. 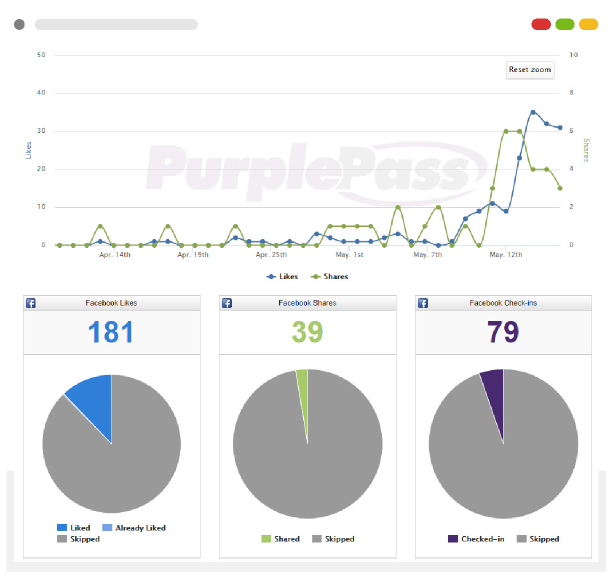 With Purplepass, you can request or even require guests to “Like” your Facebook page, share with their friends that they purchased tickets, and even be automatically checked in on Facebook when they arrive at your event. Easily view how many new “Likes” you’ve generated, how many people shared on Facebook, and how many people have chosen to be automatically checked in. Visually see on an interactive map of the world where all of your guests are from. A heat map will show the concentration of the geographical location of your guests from a country level all the way down to a city level. This allows you to view the rate of admission of your guests at your event visually broken down into 1 hour, 30 minute, or even 10 minute intervals. You can also break down your rate of admission by ticket type (e.g. General Admission vs. VIP), method of fulfillment (eg. Print-at-home vs. will call), or even by device or location (e.g. West Gate vs. East Gate). This information is vital to planning your staffing needs at your event to ensure you have enough staff for the rushes but do not have extra staff during your slow periods. View a breakdown of all coupon codes used for your event. They will all be graphed out along with a detailed breakdown, allowing you to drill down on exactly what was used when. Sales at the box office are a key aspect of your event and being able to see what was sold at the door, when, how, and by what terminals is vital for reconciling your accounting. 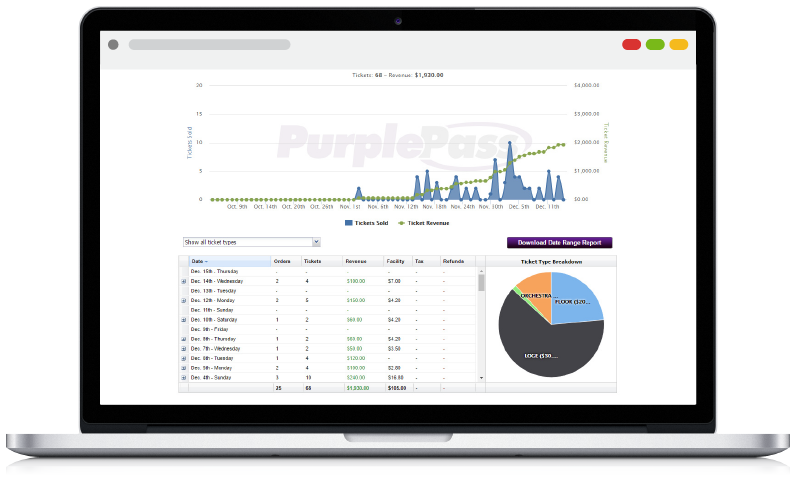 You can view all of your sales broken down by method of payment, by terminal, and even by ticket type. If you take advantage of our built-in guest list management system, you can easily view stats to get an idea of how many COMP tickets were issued and when. 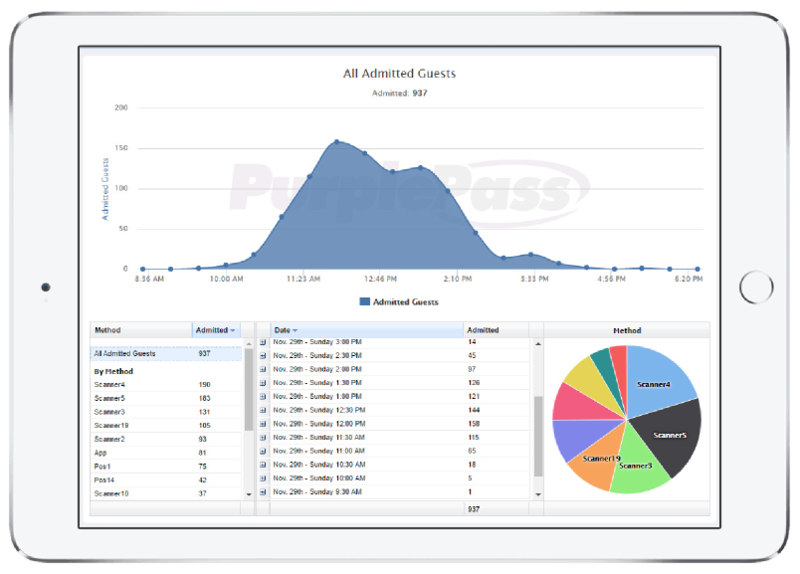 If you have a large list of COMPs and guests, this will become a valuable tool in ensuring you keep everything in check. 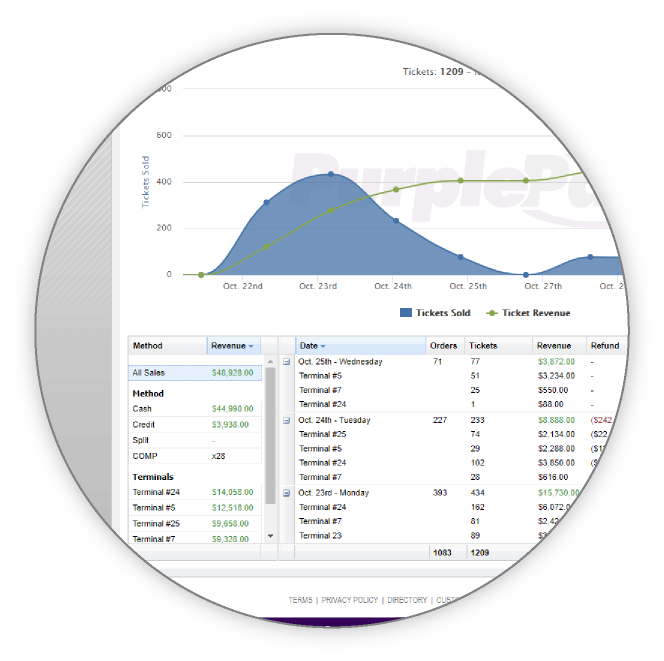 Create fully customized financial reports ranging from high-level summary reports to extensively detailed reports. Our financial reports are an accountant’s dream. 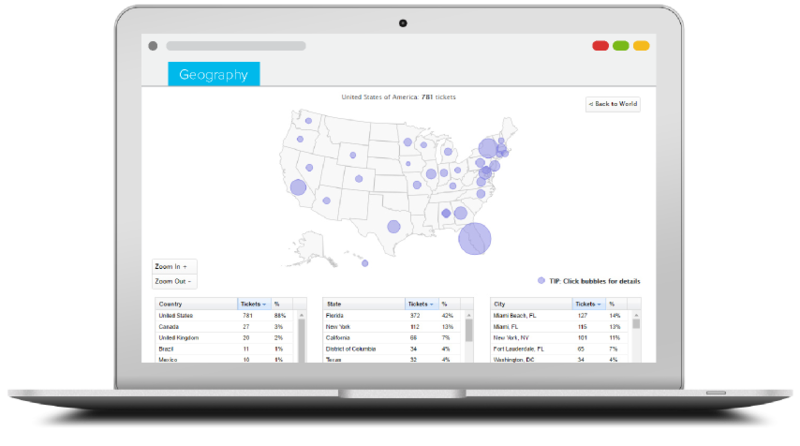 Generate detailed reports on your customer, their order history, and their demographics. 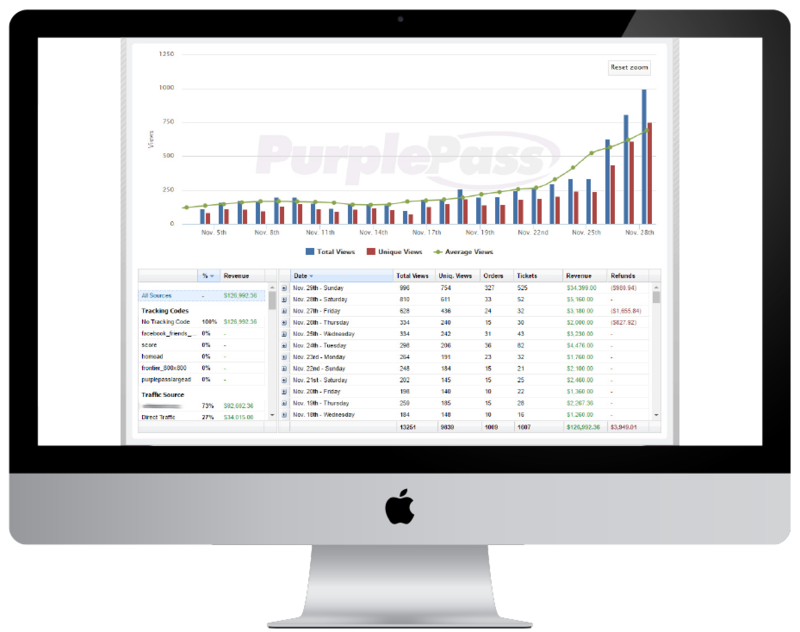 Easily export reports breaking down all of your marketing data including where your customer are coming from, how they are finding your events, what unique tracking IDs are being triggered, etc. 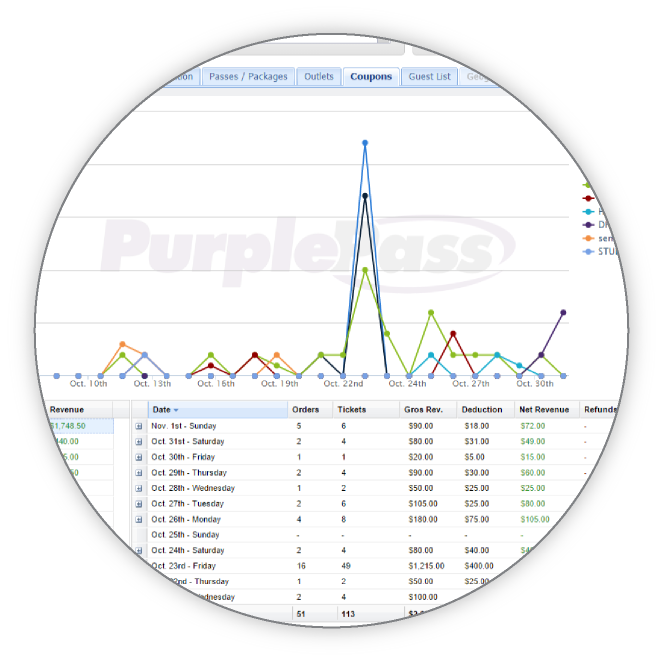 View a detailed report of all of your COMP guest list entries. A detailed PDF statement will be generated after every event breaking down exactly how many tickets were sold, how they were sold, list out any discounts and refunds, as well as any fees and charges. This is the ultimate report to see how your event did, allowing you to easily reconcile all revenues to make sure everything is on the up-and-up. 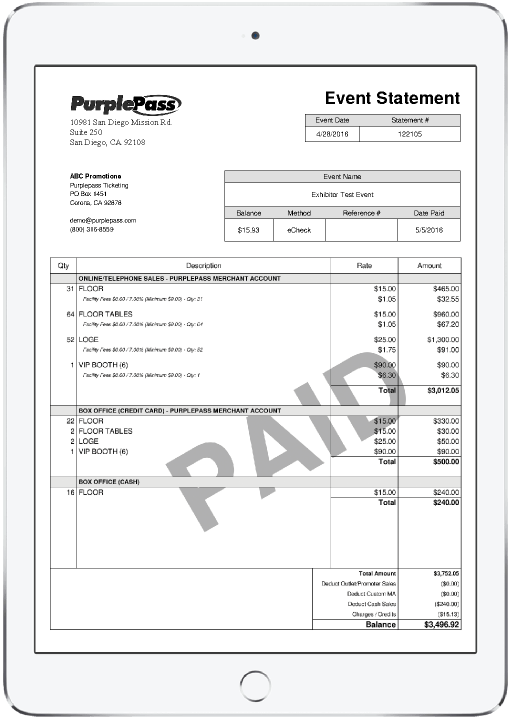 You will have access to a detailed log of all charges, invoices, and expenses on your account. 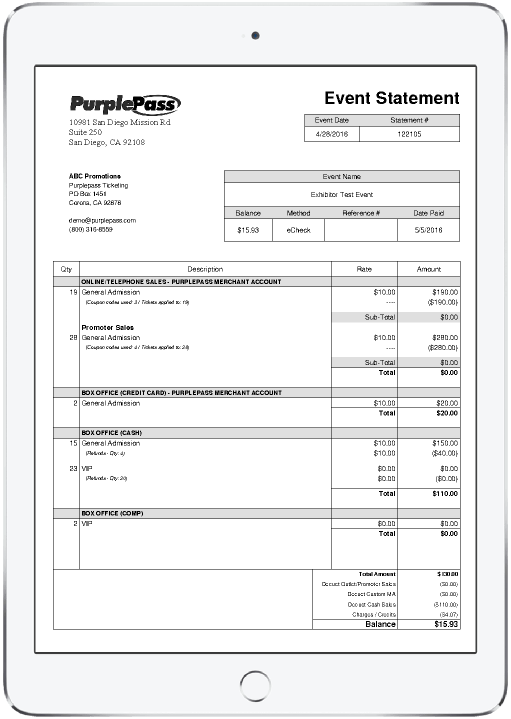 Each charge will have a PDF statement associated with them so you can print them out for your records. Get real-time email or text message notifications when sales occur. 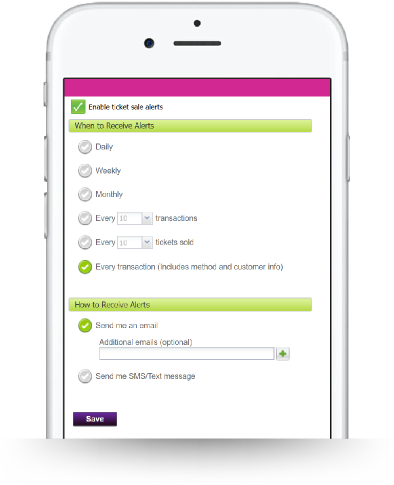 You have the choice of alerts for every sale, every X number of sales, every X number of tickets, as well as daily, weekly, or monthly digest reports. You can even add additional recipients so everyone is in the know.